What: When it comes to cooking Jewish grandmothers are an unbelievable compendium of wonderful ideas, even for brunch. NYC’s Red Cat took a cue from bubbes everywhere and began cooking its fried eggs in Schmaltz. Using rendered chicken fat is almost like cooking with bacon drippings­—it adds an extra salty, savory layer of flavor to everything it touches. 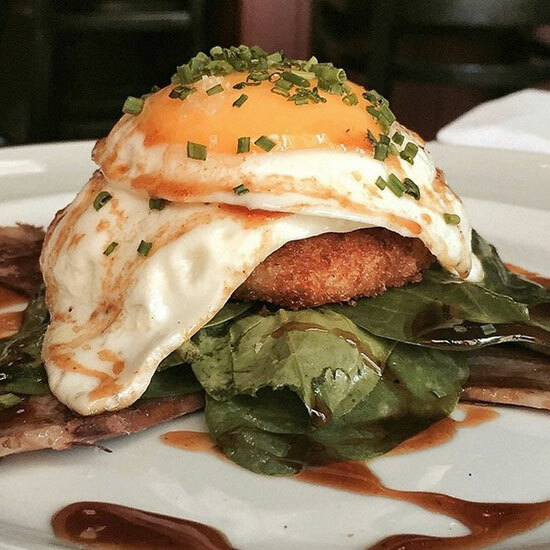 And the panko-coated cheddar-potato pancake, brisket and maple jus that accompany the eggs make it quite the nosh. Wash it down with: Something this heavy deserves a light, refreshing cocktail, like the "Midnight in Madrid," with pink peppercorn-infused gin, Meyer lemon, and lemongrass. Related: Best Breakfast Sandwiches in the U.S.